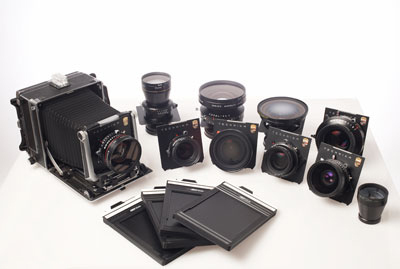 The photographic equipment today on the market is all of excellent quality. The progress of technology in the recent decades has enabled photographers to dispose of first-rate lenses and cameras that can perform wonders and obtain unprecedented levels of definition and quality. In my opinion there is no big difference between the best camera or the best lens of brand X and of brand Y. We should choose freely according to our own likes and dislikes and by the evaluation of the best use we can make of the various types of cameras. If I use a view camera 8×10″ to make photographs of a Formula One race, very likely I am going to step into many more problems and much less enthusiastic results compared to using an easy to handle 24×36 mm auto focus camera. On the contrary, if I want to make contact prints of exceptional beauty with an amazing range of greys and the highest definition, a 8×10″ view camera is probably the best solution. We can make a similar statement when talking about the comparison between digital and traditional photography. One technique is not “better” than the other: only, there are situations where a technique or an equipment is to be preferred to another according to specific needs. For the type of photography I do today, I think that my Linhof Master Technika 2000, with its 4×5″ films (about 10×12 cm) and my Schneider, Rodenstock and Nikkor lenses, are the best choice. It is with this equipment that I make the black and white photographs you see in this website, and it is with this equipment that I made the colour photos of Omaggio alle Alpi and Sulle Vette delle Alpi. However, if I had used a 6×6 cm Hasselblad I know I would have had similarly good results. In conclusion, what makes the difference is the human being : the secret is in ourselves, not in the tools we use.